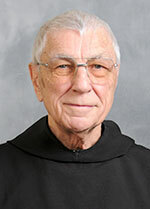 Benedictine Father Richard Hindel, a monk of Saint Meinrad Archabbey in St. Meinrad, died on Aug. 7. He was 91 and a jubilarian of profession of vows as a monk and priestly ordination. The Office of the Dead was prayed for him on Aug. 9. Following a Mass of Christian Burial on Aug. 10 in the Archabbey Church of Our Lady of Einsiedeln in St. Meinrad, he was buried in the Archabbey Cemetery. Throughout 70 years of monastic life and 66 years of priestly life and ministry, Father Richard held many positions in the monastic community at Saint Meinrad and in its seminary. Beginning in 1987, when he was 65, he began 13 years of ministry in parishes across the Archdiocese of Indianapolis. During much of that time, Msgr. William Stumpf interacted often with Father Richard as he helped oversee priestly ministry in parishes as archdiocesan vicar for clergy. “He was a great blessing because he would be willing to step in and fill in wherever we needed him to fill in, which was really wonderful of him,” said Msgr. Stumpf, now pastor of St. Michael Parish in Greenfield. In addition to simply helping Msgr. Stumpf make sure that a parish had a priest to minister in it, Father Richard was a good role model for him. Msgr. Stumpf also valued other personal qualities in Father Richard. Benedictine Father Timothy Sweeney remembered his longtime friend and fellow monk in much the same way. “He was a very personable man,” said Father Timothy, who took annual vacations with Father Richard for the past 25 years. “He liked people and got along well with people, hence his success when he was in parish work and his success, too, as a teacher. As a previous archabbot of Saint Meinrad Archabbey, Father Timothy was also in a good position to understand and value Father Richard’s willingness to serve in any role he was asked to fill. Father Richard was born in Indianapolis on July 1, 1922, to Carl and Grace (Lucas) Hindel. He received the name George William at his baptism. After growing up in Holy Angels and SS. Peter and Paul Cathedral parishes in Indianapolis, he entered the minor seminary at Saint Meinrad in 1936. He entered the novitiate in the monastery in 1942, made his first profession of vows on Aug. 6, 1943, and was ordained a priest on May 27, 1947. Father Richard taught in the science department of the minor seminary. He also did graduate studies at Loras College in Dubuque, Iowa, and at The Catholic University of America in Washington, where he earned a master of science degree in biology in 1961. Father Richard served as the director of the former St. Placid Hall, a school for Benedictine brothers, for five years; as subprior, third in leadership in the monastery, for eight years; as kitchen master for nine years; as superintendent of buildings and grounds for six years; and in Saint Meinrad Seminary and School of Theology as theology dean of students for eight years and vice rector for eight years. Father Richard also served many years as national education chairman and board member of the National Executive Housekeepers Association Inc. In the archdiocese, Father Richard served as administrator of several parishes: St. Isidore the Farmer Parish in Perry County from 1987-93; Holy Cross Parish in St. Croix from 1993-94; St. Augustine Parish in Leopold and St. Mark Parish in Perry County in 1993; Our Lady of Lourdes Parish and St. Bernadette Parish, both in Indianapolis, from 1996-97; St. Matthew Parish in Indianapolis from 2000-01; Our Lady of the Springs Parish in French Lick and Our Lord Jesus Christ the King Parish in Paoli from 2001-02; and St. John the Baptist Parish in Starlight from 2003-04. Father Richard also served as dean of the Tell City Deanery from 1993-95; as associate pastor of St. Bartholomew Parish in Columbus in 1997; and was in residence and gave sacramental assistance at St. John the Evangelist Parish in Indianapolis in 2006.